Guys, I'm going to start by apologizing for my super lame leftover picture of this dish. Yes, it was taken at my work. Yes I was eating at my desk by myself. Sometimes girls gotta hustle. I swear this dish tastes a lot better than this photo implies. I mentioned in my last post, one of the things that my boyfriend Matt and I have done to hang out while we are 2,000 miles apart is cook together via video chat. Matt has basic cooking skills so I brainstormed some recipes that were simple and delicious. Since its getting cold here (thanks a lot Alaska monster storm), I've been craving comfort food. Somehow even though Matt is in California (which is WAY closer to Alaska than Chicago), he is immune and still having 65 degree weather. I don't feel bad one bit so he will have to eat the comfort food whose recipe I provide. 1. Boil pasta according to box directions. Add diced broccoli during the last two minutes of cooking until it turns bright green. 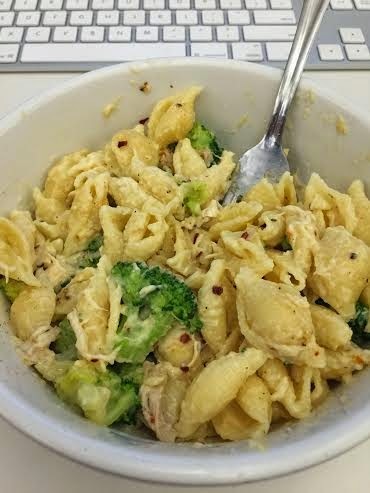 Drain both pasta and broccoli in a strainer and set aside. 2. In a medium sauce pan, melt butter. Once melted, add in flour gradually and stir constantly. It will get sort of lumpy but just keep it moving. 3. While stirring the flour mixture, slowly add in milk 1/2 c at a time. Mix the flour mixture into the milk before adding in more. 4. Once milk is incorporated, add in onion powder, garlic powder, salt and pepper. Increase heat to medium and bring to a boil. Let it thicken for 4-5 minutes. 5. Remove from heat. Stir in cheddar cheese until melted. Give it a taste and add any more salt, pepper, or crushed red pepper to taste. 6. 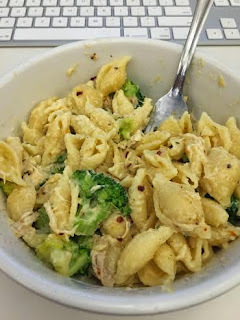 In a large bowl combine pasta, broccoli, and chicken. Pour cheese sauce over, stirring as you go. Add as much cheese sauce as you like. Serve! Inspired by this Cooking Classy recipe.